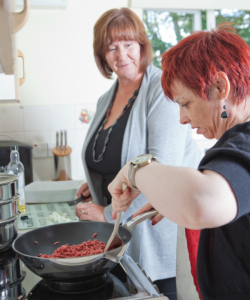 The role of a Support Worker is to assist people to manage their home and to experience the lifestyle of their choice, through the provision of practical assistance where needed, guidance, encouragement, and the support to maintain a person’s skills and interests. Support Workers also have a key role in promoting better health and improved well-being, by ensuring that people eat well, take regular exercise, and have access to appropriate health services to reduce health inequalities. It is important to remember that the person being supported should always be at the centre of any discussions or plans about their support. Support recognises that everyone has the right to make informed choices and to have a life which is rich in purpose, meaning and fulfilment. This leads to people realising their full potential and achieving their ambitions in life. Application packs can be obtained by downloading from the link below or from Reception at the Brothers of Charity Services (Scotland) on 01896 661200. Completed application forms should be returned to: Brothers of Charity Services (Scotland), Triest House, Bridge Street, Galashiels TD1 1SW by the closing date stipulated in the job description advertised.